The Field Museum on Monday announced plans for a three-year renovation of its Native North American Hall in order to “better represent” the stories of the region’s Native American tribes and people. A new advisory committee of Native American scholars, museum professionals and representatives from a number of Native tribes and nations will work together to plan the exhibition, said Jaap Hoogstraten, the Field’s director of exhibitions, in a statement. While many of the hall’s displays have gone unchanged since the 1950s, the renovated space will feature pieces from contemporary Native American communities, along with materials from the museum’s collections. “The exhibits will always be co-curated by Native American scholars and community members, so visitors will encounter unique perspectives and learn from multiple knowledge streams about the history of Native Americans and contemporary concerns and ways of life,” Hoogstraten said in a statement. The renovation includes plans to partner with the American Indian Center of Chicago. “We’re trying to help the museum find different ways to present the Native American community as a thriving, contemporary, living culture. That’s how this partnership has emerged in the last few years that we’ve been working with them,” said Heather Miller, AIC’s executive director. The project will help showcase her community’s contributions to contemporary society. “One of things that we’re seeing … is that our next generation, our youth, are really asking us to step up and be the voice of this generation and make sure that non-Native folks understand that the Native American community contributes quite a bit to the society as it is today, not only through our cultural work but also our artwork, our education work,” Miller said. The announcement comes on the heels of a land acknowledgement ceremony held last week by the Field to formally recognize that the museum resides on the traditional homeland of three Native American tribes: the Ojibwe, Odawa and Potawatomi, which together make up an alliance known as the Three Fires Confederacy. The Chicago area was also a site of trade, gathering and healing for more than a dozen other Native American tribes, according to the Field. “For too long, our histories have been interpreted through an outsider’s lens,” said Patty Loew, a member of the Bad River Band of Lake Superior Ojibwe who will serve on the Field’s new advisory committee, in a statement. Loew directs the Center for Native American and Indigenous Research and is a professor at Northwestern’s Medill School of Journalism. “This renovation, in which indigenous people are participating, provides an important and long-overdue opportunity for us to tell our own stories,” she said in a statement. 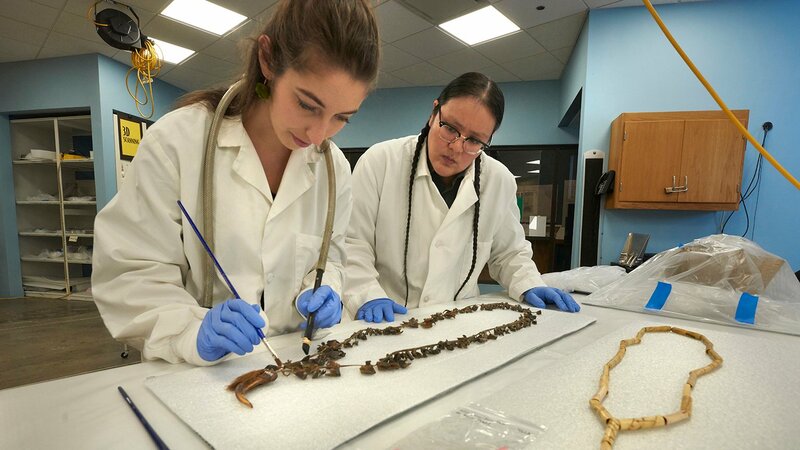 Alaka Wali, the Field’s curator of North American Anthropology, said the museum has started to hire new Native American staff as part of the revamp, including community liaisons, anthropologists and collections and conservation staff who will care for objects in the museum’s collections. Work on the exhibition will be ongoing for three years, with plans for the revamped hall to open in late 2021, the museum said. The hall will remain partially open to visitors during renovations. “I’m excited about the opportunity to talk about Native history and about natural history from a Native perspective, and to reimagine the hall from that angle,” said Meranda Owens, a postdoctoral scholar working on the exhibition and a person of Northern Paiute and Mexican-American heritage, in a statement. “Since the hall hasn’t been updated in sixty years — apart from recent additions of contemporary artwork — guests have had no exposure to the various ways Native communities have survived and how they are living today. Note: This story was first published Oct. 29, 2018.